Yay. We had a mini celebration for my grandma today! Well, you know why I called it a mini celebration? That's because the hooman have the celebration among themselves WITHOUT us! So, they are guilt-stricken and decided to hold a mini celebration to make them feel better. Well, what the heck! At least I got to eat chicken! But nothing can compared to the yummy fried chicken! 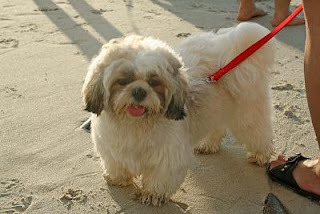 Take a closer look at me...Mommy said that I am growing fatter d...What do you think? 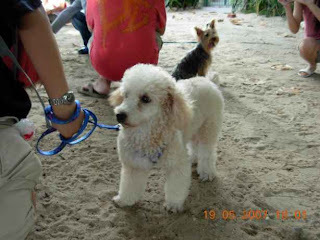 Hmmm...if you ask me, I would say juz nice lor....Okok..a bit out of shape..but don blame me..Blame mom! She is sooo lazy to take me for an exercise. So it's all her fault! Hey everyone, I am BACK! sorry for being MIA for so long...blame it all to mom! She was too busy to update my blog...As usual, busy with work lo...and recently also busy with 'relocation'...Hehe..Yup! We have all moved to a new place! 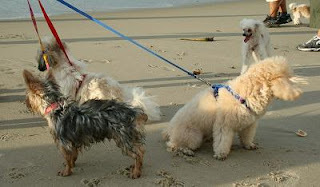 A bigger place...So now, I have a big space to run about and to chase Sze Ern and Sheena...All of us are doing well. Thanks for your concern...Will update more pics of my new home soon...Stay Tune! It's very easy actually. All you have to do is to nominate 7 cool gals with blog, and then they pass it on , and so forth. I'm gonna nominate Molly, Pacco, Amber-Mae, Kyra & Amber. Before we start our journey. A Happy Family Picture! Sze Ern pressing hard forward! GO! GO! GO! Everyone including myself tot Sze Ern will definitely give up half way. But she proves us all wrong!!! She completed the whole journey! KEEP IT UP GURL! We are proud of you! YAY! We finally make it! Well...although it is not exactly the top, but this is the closest resting place near the top. So, we decided to rest here. See all of their tired faces? Ha, I am still full of strength! After a short break, we make our way downhill. And then we stop at the stream. Ooo...the water is so refreshing. I LUV IT! I luv to drink the fresh water. And the cool water really refreshes my tired feet! 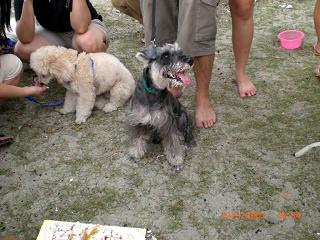 Even Aunt Sarah and Sze Ern also enjoy the water. Sorry ya...everyone is too engrossed with the stream till no one has the time and energy to even look at the camera. Mum: Ok, come on girls! Let's go home! Hahaha...This two is better. Still very strong. But of course. Nothing can compared to mum and I. We are still full of energy. We are borne to be with each other! YIPPIE! Do I look funny or what??? Aunt Sarah managed to catch me in the act! Hmmm....I guess everyone must be wondering why I sleep like dat...Okok..actually I am trying to act 'cute' so that someone can come and rub my belly. So, how's my act? Successful ah? This is the full view. Sorry ler....I know I am not being very 'polite' by laying down like dat. But what the heck..at least I make everybody around me laughs! Yay! Today we receive parcel from Lily and Goofy. Inside got magazines for mummy, food for us and clothes for Sheena. Yippie! Thanks ya Lily and Goofy! Sheena is enjoying her every moment of being a model. I wonder what is she dreaming of. Hey, Sheena, wake up! I AM the supermodel ok! Me and Sheena showing our belly. Mum always say that we are very tom boyish when it comes to our sleeping pose! Hey mum, you are very very wrong. We are not tom boy. We are just ENJOYING ourselves ok! I am being tagged again!!! This time is by Precious. And this is one real tough tag. Mummy have been searching all over the web to find a picture with at the very least have some slight resemblances. So, we finally got one although not as good as what Precious has in her blog. Ok...manage to see any similarity??? And last but not least....we are both BEAUTIFUL!!!! Now.....it's my time to tag.....Goofy, Molly, Ben and Amber-Mae...it's your turn!!! Do I look pretty or what? I got new clothes from my fren, Coco d ACS. Mummy says I look like children going to nursery. What do you think? This is the back view of the dress. Don't you think I am ready to go to school? 1. I will bug mummy to carry me to see outside the window EVERYDAY! And if she doesn't, I will kiss and paw her until she did. And I never failed! 3. I can't sleep if mummy is not home. I will miss her sooo much that I'l cry. 5. I LUV ear cleaning. 6. I LUV going out for a walk. 8. I will not let stranger carry me! Dat's my pawfacts. Ok, now is your turn. Kyra, Momo and Precious. CATCH THE BALL!!! This is me, hanging and lazying around...Although mum has posted this picture long time ago, but she still thinks that this is very silly....How about you??? Hope you guys enjoy the pictures...Mummy is hoping to snap more silly picture of me....YOU WISH!!! Guess what guys and gals!!! 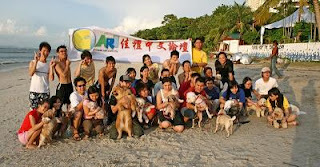 We went for dog gathering @ picnic at the beach in Tanjung Bungah on 19 May 2007!!! And we had lotsa fun there!!! I got to know many furkids and hooman friends...All of them are very very nice...I hope there will be more gathering in the future for me to have fun :) Here's our group photos! Find me please!!!! And of course, this is me!!! You could see how much I enjoyed myself by seeing my facial expression!!!! 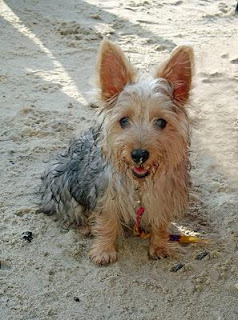 And this is sze ern....as usual, looking a bit blur....Hahahahah...but she enjoyed the sand and the sea water too!!! Same with Sheena...She's happily 'manja'ing with everyone!!! Mummy fed me with cake! It's so yummy that I don't have the time to look at the camera at all!!! Ok, here's me!!! Hmmm...I wonder what am I curious at...Can't recall d...sorry ya! Yay!!! I received more pressies. Thanks to Ben Ben and Zen...We love it a lot!!! Chat with Sasha and Mommy!